The final day of my 2018 chase vacation and it appeared that there might be a decent shot at some gorgeous storms in the Black Hills area of western South Dakota. I spent the previous night in Spearfish and sat around there for most of the morning waiting to see if I’d need to move south or not. SPC had outlined a slight tornado risk along the I-90 corridor east of Rapid City, with a surface low in northeastern Wyoming and a warm front draped across South Dakota, that seemed like a good bet for organized storms. Of course, initiation was most likely in the Black Hills with the rising terrain. 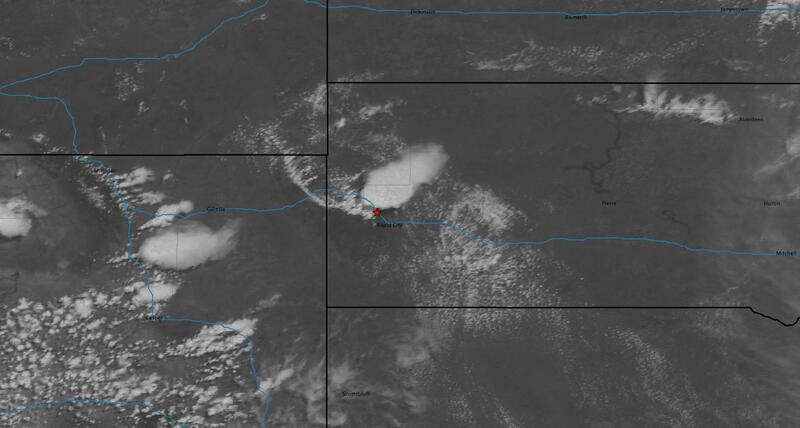 Satellite imagery began to show a developing cumulus field to the south and east of Rapid City so shortly before 18z I began the trek down I-90. SPC issued a mesoscale discussion for a possible severe thunderstorm watch at 19z which they issued about 30 minutes later. 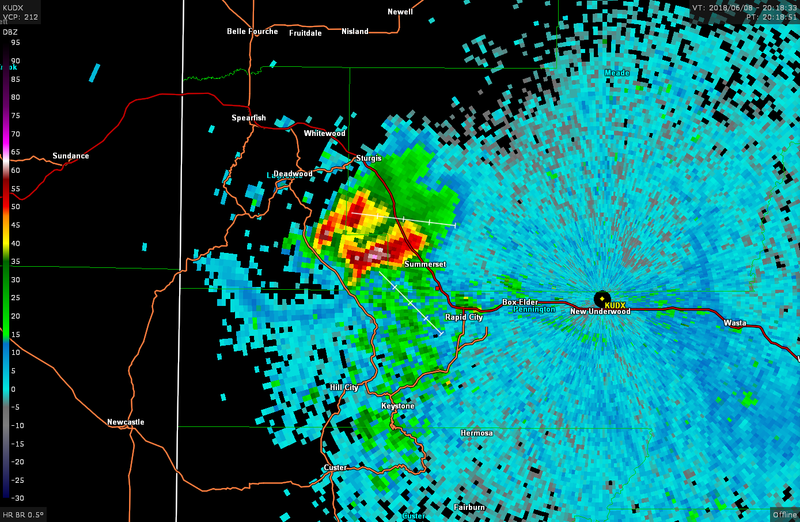 The first cell started to develop around that time in the Black Hills northwest of Rapid City. The storm hung around in the hills and it was difficult to get much closer to see what was going on underneath. I made an attempt along Bethlehem Rd north of Piedmont, but only tree lined narrow winding roads lie ahead obscuring the view even worse than before. 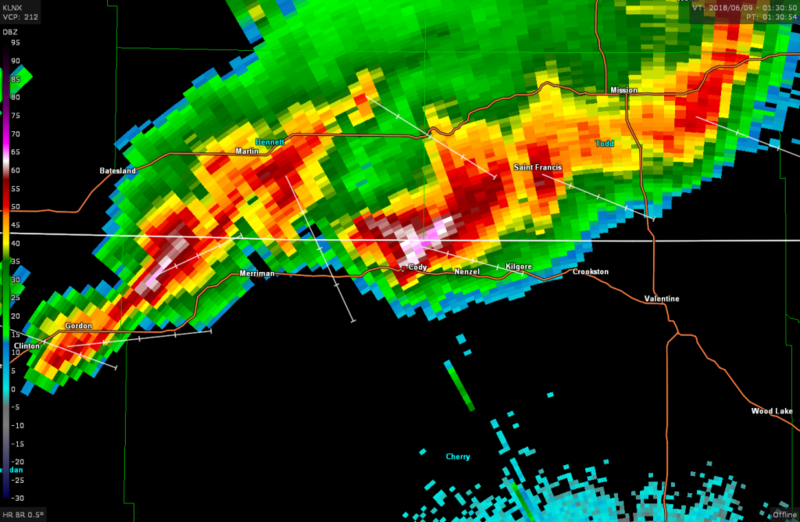 The storm began to drift southeast so I got back on the main highway and drove south to stay in front of it. West of Rapid City I decided to venture west on highway 44 to get under the storm, and what I found was some baseball sized hail that did a little number on my car. 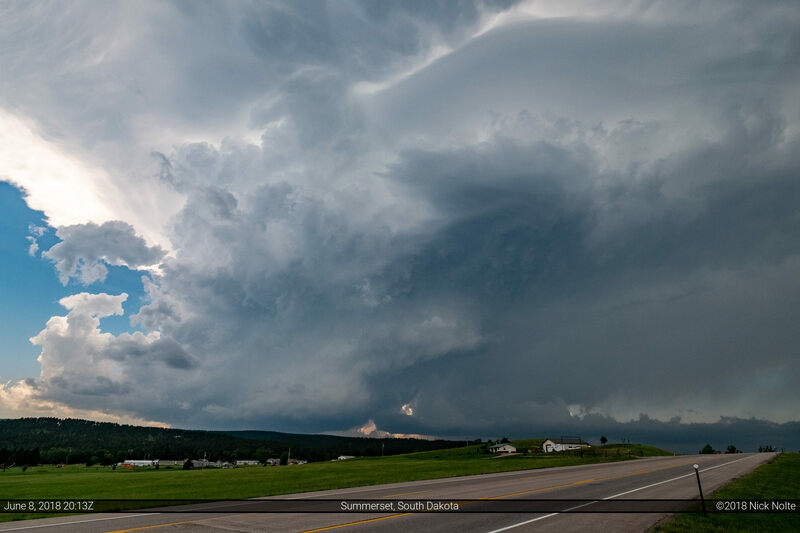 Now I had to double back towards Rapid City and in a quest to get in front of it without having to core punch I opted for some residential streets through the southwest part of town that brought me highway 79 south of town and kept me out of more hail. I took the highway south to Hermosa where I found a nice spot to pull off and shoot the storm for a while. 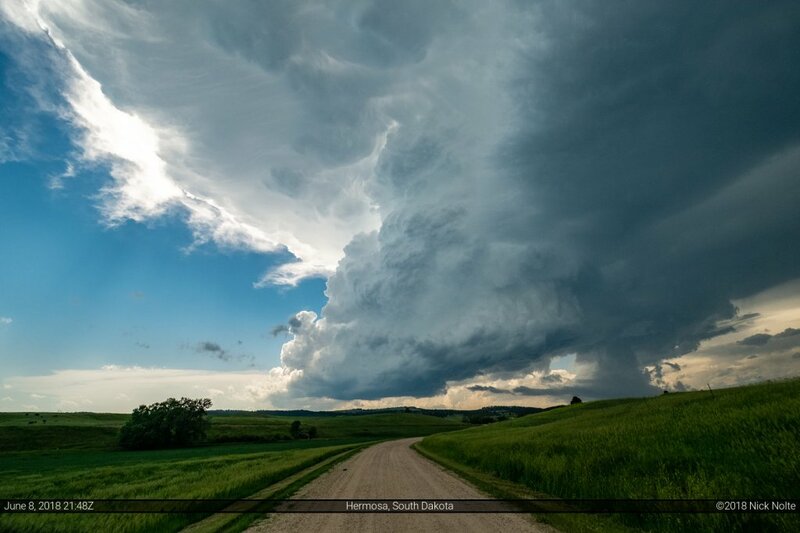 After a while it became clear this storm was weakening and so I had to decide whether or not to stick with it or bail east and see if I could catch up with the couple supercells that had formed east of Wall, SD. I bailed east on some rural roads east of Buffalo Gap and spent the next hour or two navigating less than optimal roads. At this point, I was just trying to get to a main east/west highway to begin heading home. 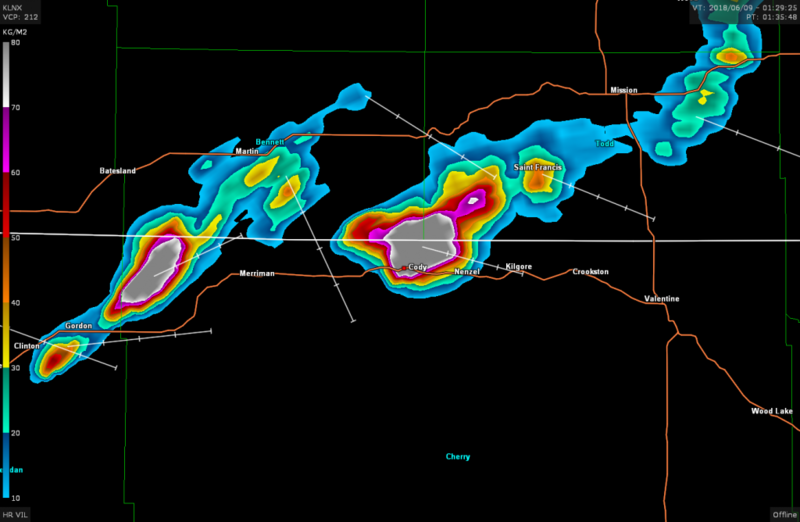 I caught up to the complex around Cody, Nebraska and made the decision to punch through the core. Since I’d already broken the windshield earlier in the day, I figured if I was ever going to intentionally drive into hail, now would be a decent time. 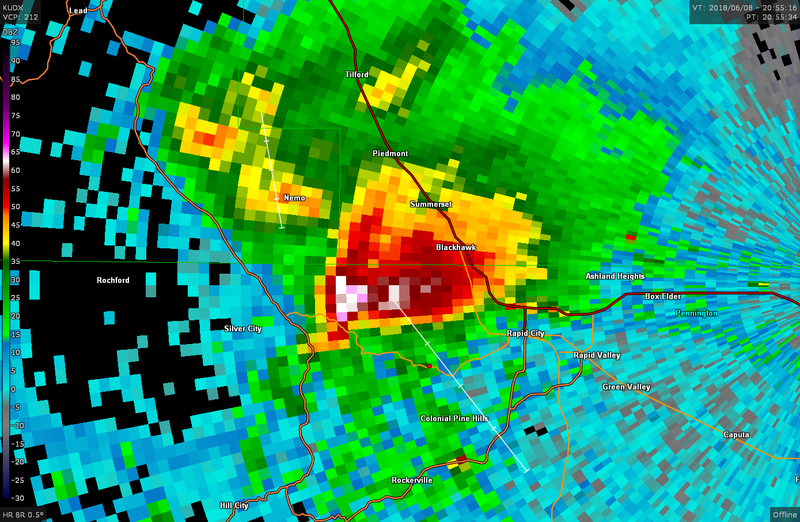 Vertically Integrated Liquid product showing potential large hail, with location marked. 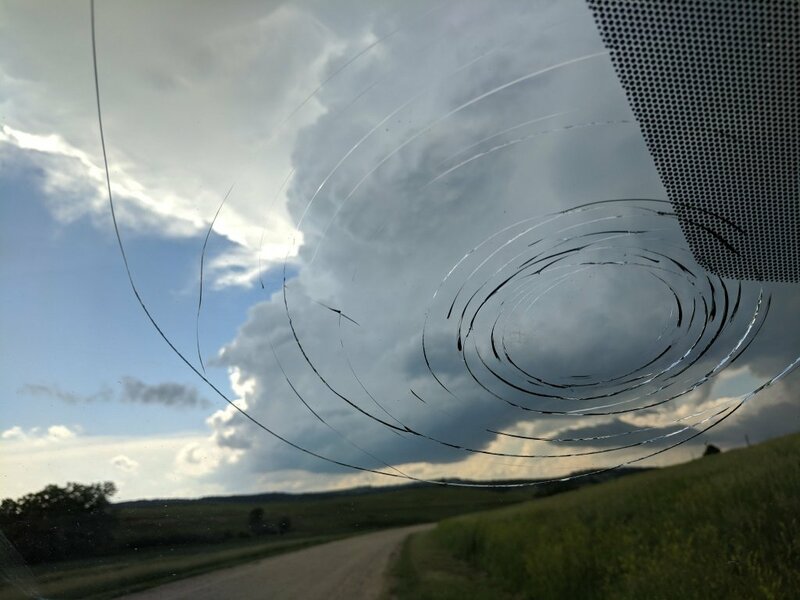 And there was definitely some more hail in there that put another couple designs into my windshield, but I did manage to get in front of the storm and get to Valentine which allowed me a clear shot down US 83 to N-2 which takes me home.